San Francisco’s City Beer Store has reopened in an attractive modern building that’s larger and closer to the Civic Center BART station, at 1148 Mission Street. Emerging from 12 years underground – literally – on a gritty block of Folsom Street in the South of Market neighborhood, virtually hidden from passers-by, the haven for craft beer enthusiasts has emerged in expansive new digs at street level, with much more cold storage for cans and bottles, a full kitchen and a whole lot more room to relax. The best news for the City Beer regulars who live in the neighborhood is that it’s only a three block walk from the CBS old location. A blue fence along the street delineates a patio area with tables. Traverse that space to emerge into a playful interior with a kitchen counter to your left and a long bar ahead on your right. Passing the bar, you see seating nooks perfect for small groups and conversation. Ahead is the store itself, a veritable beer library, with ample capacity to refrigerate cans and bottles as they await purchase. Behind the long, lustrous natural wood bar is a huge cartoon mural by beer artist Nick Fullmer. Patrons gaze upon a city underwater, populated by curious creatures including a platypus.The furry duck-billed platypus has been the City Beer Store mascot since the early days on Folsom Street. The overall feel is spacious, comfortable and playful. Co-founders Craig and Beth Wathen hadn’t planned to take on such an ambitious upgrade. Like so many changes in SF these days, the move was motivated by City Beer’s landlord at its former spot. The lease rate shot up 60%. When Craig Wathen tried to negotiate, the landlord suggested the price of a beer just needed to go up a buck or so. The Wathens were not interested in making customers pay for their landlord’s desire to cash in. In the process of looking around, the Wathens came upon the empty restaurant with the long, striking bar in the condo building on Mission Street. 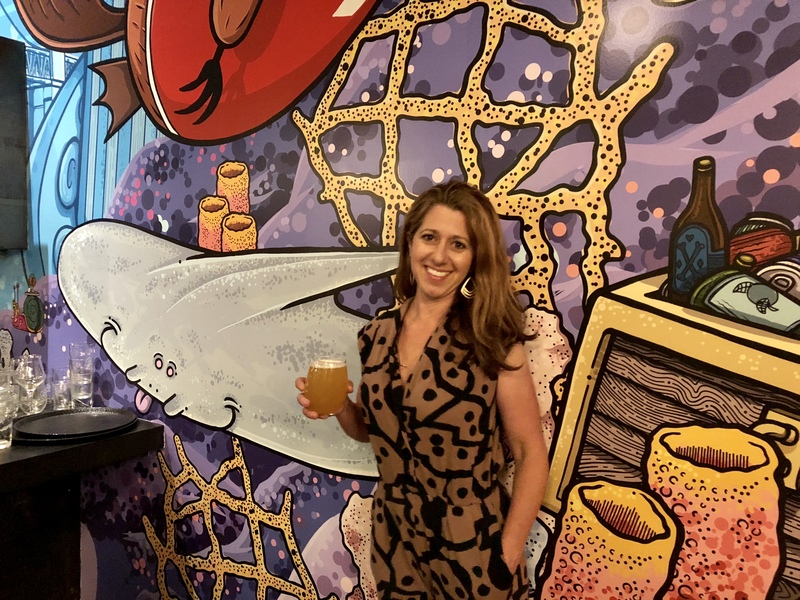 While another spot in the Dogpatch neighborhood also appealed to them, they chose to stay in the neighborhood where City Beer had developed its community. The nearby place, empty since 2015, was bigger than they were looking for, but it offered them new opportunities. Importantly, the restaurant premises were for sale as a commercial condo. “Owning means we won’t have to go through what we just went through with our landlord. We have cost certainty, into the future,” said Craig Wathen. They took the plunge, taking on debt in search of a degree of independence and for the continuation of the gathering place they loved. During the remodel, two old-fashioned Golden Gate style kegs were cut up for light fixtures, one from Triple Rock and one from John Martin’s former south-of-market brewpub, Twenty Tank Brewery. You can see that long lost brewery’s name in red paint on a metal sconce opposite the bar. For some patrons of the new City Beer Store, it will evoke another era. Back in the years of the initial dot-com boom, the popular Twenty Tank Brewery on 11th Street suddenly closed. It seemed that the landlord was smelling money from new businesses coming into town. During the last years of that bubble, some found it acceptable to drastically ratchet up the rent on commercial spaces hoping for “better” tenants, many of which would be out of business within a year. Unlike City Beer Store, the bustling Twenty Tank community simply went away. Its brewers spread out around the Bay and the nation, while its owner retreated from SF, shifting his focus to Drake’s in the East Bay. Back in 2006, when Craig and Beth Wathen got started in the tiny below-street-level shop on Folsom Street, there was nothing quite like it. To enter was to descend into a figurative and literal beer geek underground. Craig Wathen would pour curiously small glasses of beer. There was no loud music, no TV, but nearly always a small gaggle of people eager to talk about the beers they were trying. It was an unorthodox hybrid business – a bit like a platypus. City Beer Store was originally envisioned as a tiny specialty bottle shop with beer tasting. While the Wathens knew that Toronado, the OG San Francisco beer bar, had a license that allowed the sale of beer to go, they were flipping the model on its head by offering more beers in containers and only a handful on draft. Beth Wathen remembers that, out of respect for the pioneers in the industry, “Craig spent time calling beer folk, including Dave Keene at Toronado, to tell them we were opening a beer bottle shop/tasting bar.” She reflects that the Bay Area community was “truly good” to them in 2006. Going all-in to lease the space with their personal credit cards, the Wathens applied for a liquor license from the state and were refused, to their surprise. The couple pointed out that the model they had proposed was very close to a perfectly ordinary wine tasting shop. The state ABC office reconsidered, replying with the caveat that only a one ounce sample could be poured. After further negotiations, CBS came away with restrictions limiting beer pours to six ounces. The City government, wary of adding another South of Market drinking establishment that might prompt police calls, told them they would have to close at 10:00 p.m. It soon became clear that the shop was not a crime magnet, so the pour restrictions were removed. A decent-sized glass of beer became the norm. Customers returned with friends. The cramped spot played host to visiting brewers, SF Beer Week events and special beer releases, including some created for City Beer in collaboration with greatly admired breweries. There simply weren’t more than a few chairs in the whole place, and they wanted to hang out. The Wathens never expected this. 2011 was a watershed year for the Wathens. It was the fifth anniversary of CBS, marked by noted collab and tribute beers made with and for them. And one day, when the business tenant in the small unit next door revealed plans to move out, the Wathens made a move to double their footprint. They were finally able to knock down a wall and append more room to mingle and sip. Now they could offer 15 taps, expand the bottle shop and add more seating. However, he notes that sales continued to be 50/50 between over the counter and out the door. Once markets like Whole Foods and other buyers started paying attention to the growing popularity of craft beer, the Wathens had to adapt. “We started traveling to pick up beers from breweries that didn’t distribute in our area.” In those days, that meant mainly from San Diego. Eventually this got to be too burdensome. According to Craig Wathen, his mom wanted to help the business. So she started a small distribution company to bring in pallets of beer rather than just a station wagon’s worth. Some of the beers coming in were revered and elusive whales he placed in a special cooler visible behind the bar. The new beer treasures were spread around, supplying not only City Beer, but Monk’s Kettle, Toronado, Ledger’s Liquors In Berkeley and Monument Wine and Spirits in Concord. City Beer now felt more like a hip underground gathering place than a retail shop. In 2013 ,Beth Wathen wanted to make a respectful statement about one of her perceptions of the regulars who loved the place. She invited select customers to a creative photo shoot and bottle-share called The Ladies of City Beer. Prints from the photo shoot later graced the walls as one of several art installations that reflected on the people who congregated there. In 2015, the Wathens and a group of friends bought one of the curious mainstays of the early days of the craft beer renaissance, a small performance venue in the Mission District called Amnesia. The bar had always featured interesting beer and eclectic live local music, an unusual combination in the early years. They refurbished the venerable joint with respect for the earned funk and patina of its past. The tap list had a major upgrade and the same favorite local bands were encouraged to keep performing there. In late July, the Wathens threw one last party to say goodbye to the original City Beer site. Former employees and regular patrons gathered to share beers and memories. Matt Coelho, one of the early employees the Wathens hired after virtually running the store by themselves for five years, reminisced about the basement beer Mecca on its last day of business. Coelho met his current business partner, Jim Woods, there.They went on to found the Cerveceria Mateveza, now Woods Beer Company. He also remembers meeting CBS regular Bryant Goulding, who went on to co-found Rhinegeist Brewery in Cincinnati, OH. When Connor Casey, now co-owner of Cellarmaker Brewing Co., was planning a move to San Francisco from Colorado in 2008, he Googled “amazing craft beer in San Francisco” and City Beer Store came up. He headed there shortly after arriving in town. “It was the only place you could get beer that was face-ripping and aromatic,” mused Casey. “City Beer was like going to the farmers’ market of beer, just like you were gonna see these crazy fruits and vegetables you’d never seen before. Casey worked there for almost two years before moving on to build Cellarmaker one block away from the original spot and now about three blocks from the new place. At last Thursday’s soft opening, a good-natured crowd of about 60 people endured an hour delay outside of the long blue fence at the new City Beer Store. When the staff finally resolved an issue with the POS system, they opened the doors and watched the crowd stream in to swiftly fill every seat and besiege the coolers in the bottle shop. Beers, wines and ciders started flowing from the 60 taps – 30 selections mirrored at each end to facilitate service at the long bar. Chef Mike Gifaldi began to serve up burgers and jambalaya from the new kitchen. City Beer appears to back on track. Nice article. I remember going there when they just opened. Will get there soon.